The 21st Annual Avila Beach Blues Festival - Otter Productions Inc. | Otter Productions Inc. The 21st Annual Avila Beach Blues Festival - Otter Productions Inc. The Avila Beach Blues Festival comes of age! Sunday, May 25th, Otter Productions is proud to present the “21st Annual Avila Beach Blues Festival”. 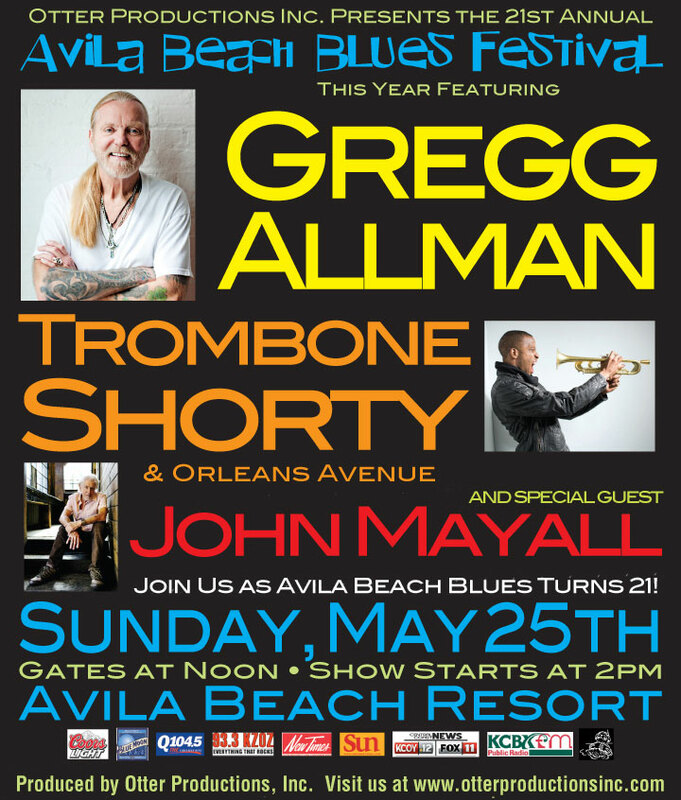 This year featuring the iconic Gregg Allman from the Allman Brothers… Trombone Shorty & Orleans Avenue will be filling in the middle slot, and John Mayall returns to the Avila Beach Blues Festival opening the show. (John Mayall headlined the first Avila Beach Blues Festival 21 years ago!) Gates at noon, show starts at 2PM. All Ages Welcome. Rain or Shine. Advance Reserved and General Admission tickets will go on sale Friday January 31st at noon at all VALLITIX locations including Boo Boo Records in San Luis Obispo, charge by phone at (888) 825-5484, order on-line at vallitix.com. If you can get Dave Alvin to play like Santa Cruz Fest I am in! A good show, I’ve seen two of them. Limo? Why didn’t I think of that? Arrive in style! Do you drop off down at the lower entrance? Will greg allman do a full show? Avila is NOT listed on his concert calender. Keb Mo and Bonnie Raitt a super ticket, saw them both together before.